I am very fond of Pingdom for uptime monitoring, most comprehensive solution. On other hand free account is only good for a single check (site). Was it up uptime monitor service caught my attention with several signs of great web app – free stuff, reliability and passwordless login. 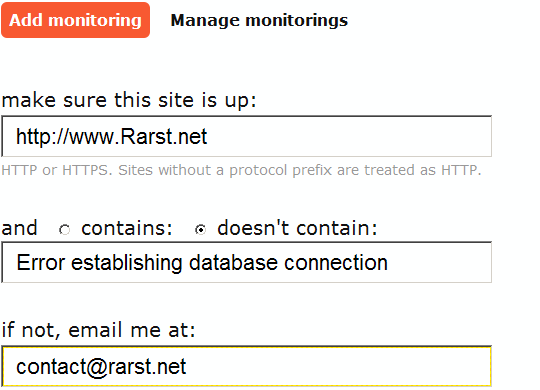 You set up checks with URL, optional text to (not) be present and email address to notify. Email also acts as account identifier and can be tied with up to ten checks. When downtime is detected or resolved notification is sent. I like passwordless logins a lot, it’s a pity they are rarely used (only other web app that does and I use regularly is Resnooze). Essentially there is no login or password to remember. In each email there is unique link that logs you in on site. So far service was very reliable, completely matching Pingdom in catching several minor downtimes. Checks are every five minutes. Doesn’t match every minute Pingdom check option. There are also no stats saved. No fancy graphs or anything, only notifications. Free and reliable downtime notifications for multiple sites. Doesn’t come close to Pingdom in functionality, but that is out of free services realm. Good one. In the past I have used Montastic but this seems a little better in terms of features (which isn’t saying much). I will stick with Pingdom for this blog, but wasitup is good for other sites like Appnews. LOL – I’m surprised you kept me there! This looks cool. I’ve had a couple of problems of late with HostGator – This might be a partial solution. I definitely need some kind of server monitor service. For dealing with hosting it helps to have graph, logs and stuff – Pingdom might be more helpful. wasitup.com is down. downnotifier.com looks like a good alternative.